In July 1854, a small business from the town of Geislingen exhibited its metal goods for the first time at a Munich industrial expo. As one local newspaper glowingly put it, the company displayed “an assortment of beautiful silver-plated wares”. The Straub & Schweizer metal goods factory had started its production activities in 1853, and within a generation it grew from a modest business employing just 16 workers to an internationally recognised company. Today, WMF (which stands for “Württembergische Metallwarenfabrik”) is a global brand. The earliest picture of the Straub & Schweizer metal goods factory. In Albert Kappis’ oil painting, the idyllic landscape still dominates the scene. In the 1860s, the Straub metal goods factory was especially successful in the north of Germany. In light of this, a decision was made in 1868 to open the first WMF sales branch in Berlin so that northern German retailers could be supplied with the goods they needed more easily and quickly. In 1869, the Württemberg chamber of commerce listed the growing company’s key sales regions. In addition to northern Germany, these included Holland, Denmark and Russia. After the company was renamed from Straub & Schweizer to Straub & Sohn in 1870, Daniel Straub and his son Heinrich decided to sell their products abroad themselves. The success of the Straub family’s metal wares was, from the very beginning, down to their outstanding design. An industry trade fair in Ulm in 1871 was a high point and burnished the company’s reputation far beyond the boundaries of the Württemberg region. In 1874, the father-and-son business decided to seize the initiative and send its first ever representatives to Italy and, later, Romania, where Straub opened its first foreign sales branch in the capital of Bucharest in around 1878. In 1880 the Straub & Sohn factory merged with the Ritter & Co. metal goods factory, forging WMF AG – a company that now had 500 members of staff. The acquisition of Ritter & Co. also introduced an element of arts and crafts, since the company did not produce utility products, but luxury items and what were then considered to be artistic goods. Before merging with Straub & Sohn, it had assumed that this more artistically focused market would continue to grow and hoped that competition would be less fierce in this area. WMF’s product line included ornately decorated and intricate utensils, pots, decanters, butter dishes and glass punch bowls – but it went beyond this too. … was already popular in the 19th century! 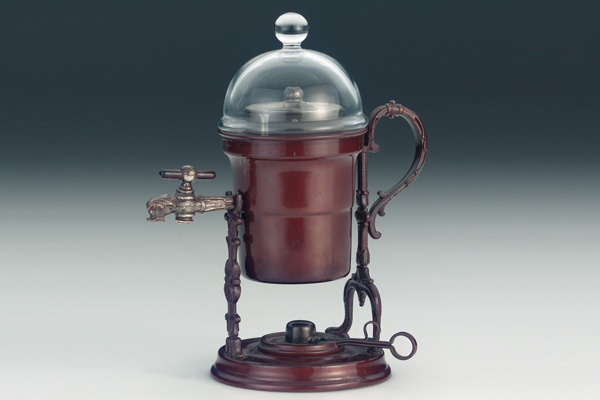 The first WMF coffee machine – though for domestic use exclusively – originates around 1880. By around 1890, WMF had built the key foundations for its future success. The value of its total assets grew from what was then 1.6 million marks in 1880 to around 5 million marks, remaining at this level for several years. At this time, almost 2000 people were employed at the Geislingen site. In 1897, the company’s expansion reached new heights as the Göppingen-based business Schauffler & Safft (which would later become a production site for the first large-scale coffee machines) was taken over by WMF. This ultimately led to a further period of growth, after which WMF became the largest industrial enterprise in Württemberg before the First World War. With the introduction of Cromargan, a stainless variety of steel, WMF became even more established on the market. By the time the Second World War had ended, this easy-care material had replaced silver-plated goods in private households as well as catering establishments, hotels and hospitals. Cromargan also greatly improved the production of coffee machines and created an impressive level of growth in this area. Today, the WMF Group employs almost 5800 people worldwide, around 2000 of whom work at our headquarters in Geislingen. The distribution network of WMF has numerous international links, offering outstanding consulting services in various countries through subsidiary and partner companies. As history proves, WMF is a partner with a vast wealth of expertise. Our story is 164 years in the making – and it’s one of success. The main administration building was constructed in the mid-20th century and, to this day, remains one of the most important buildings at the WMF headquarters site in Geislingen.